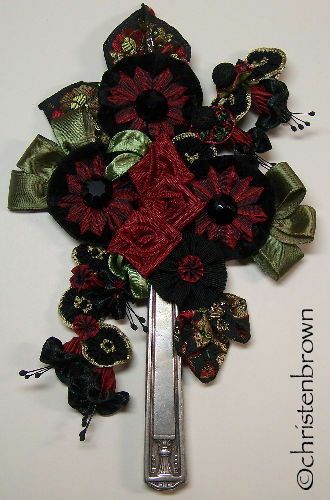 I wanted to share a few of the gallery pieces that I made for my book Ribbonwork Flowers, published by C&T. The directions are offered in the book for all of the flowers and leaves that are included in the bouquets. 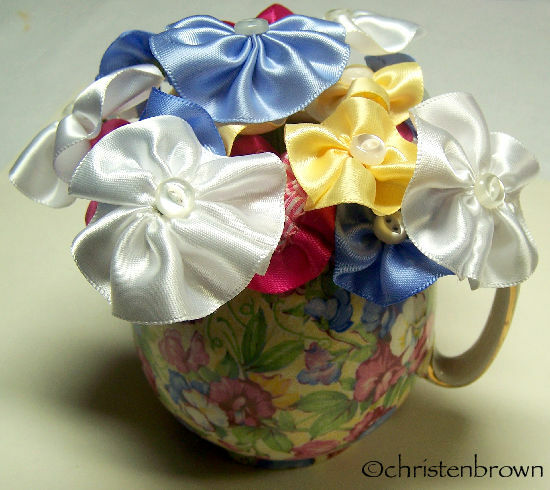 This is a vintage china creamer filled with Rosette flowers made from satin ribbon in 7/8″ and 5/8″ widths. The china pattern is called Sweet Pea, made by Royal Winton during the 30’s and 40’s, and is one of my favorites. “Bride’s Choice”, started with an old salt shaker. I thought that the holes at the top would make a perfect “frog” to organize the flowers. 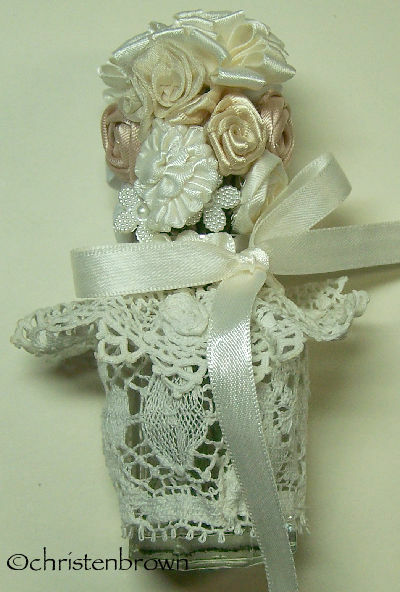 I covered the shaker with a vintage piece of cotton lace, and satin ribbon. 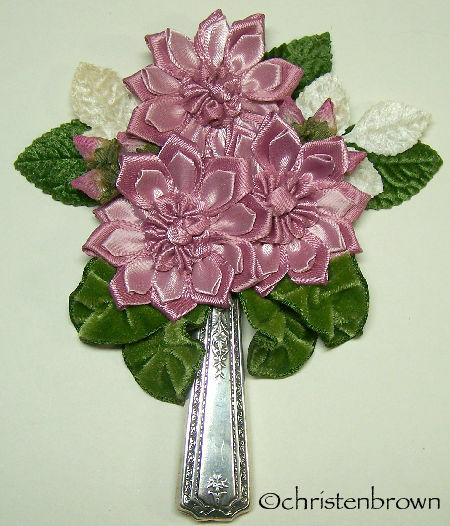 The flowers are made from a variety of silk bias, satin and grosgrain ribbons in 3/8″ and 5/8″ widths. I also included a few buttons to fill out the bouquet. “Grand Duchess”, started with a sterling silver knife handle, that my dad had made for me. I filled it with the Grand Duchess flower made from two different widths of satin ribbon. The leaves are made from vintage velvet ribbon, with a few vintage milliner’s roses and leaves placed in the background. 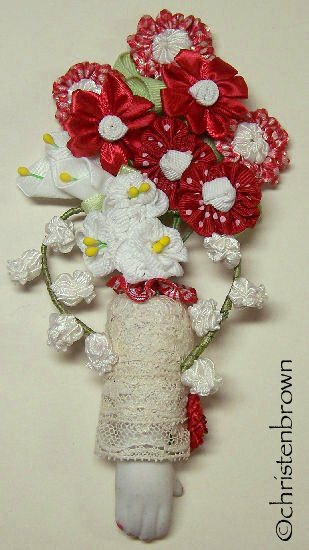 “Red and White Vase” started with an antique arm from a china doll. I covered the arm with bits of vintage lace. I used grosgrain, satin, novelty and jacquard ribbons for the flowers. I chose the Lily of the Valley, Sweetheart’s Flower, Calla Lily, Star Point Petal Flower and Boat Gather Petal Flowers. “Geisha’s Delight” also started with a sterling silver knife that my dad made for me. I used a variety of materials including vintage velvet, grosgrain, satin, and jacquard ribbons; vintage stamens and vintage beads. The flowers are the Cup and Saucer Vine, Rosette, Star Point Petals (stitched onto the velvet Rosette), and Puck’s Rose. This is a new class that I am teaching today, and next Tuesday for Joggles.com. The base of each embroidered button is made from Hanah silk bias ribbon, then embroidered with YLI silk embroidery ribbon. This weeks class is all about making the ribbon bases. This is a sample of the three different roses that the students have to chose from. I designed this brooch for my niece Jessica Hamilton creative and talented owner of Doll Project. 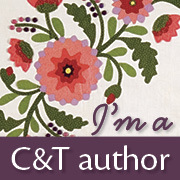 The directions are free in her newsletter for February, which you can sign up for here. The brooch is made from individually made peapods, “new peas”, leaves and flowers. These are made from a variety of ribbons, silk bias, satin and French wire. I have made kits in three different color ways, which you can find here. These are available through the month of February only, or until supplies run out. The cost is $5.00 plus shipping and handling. 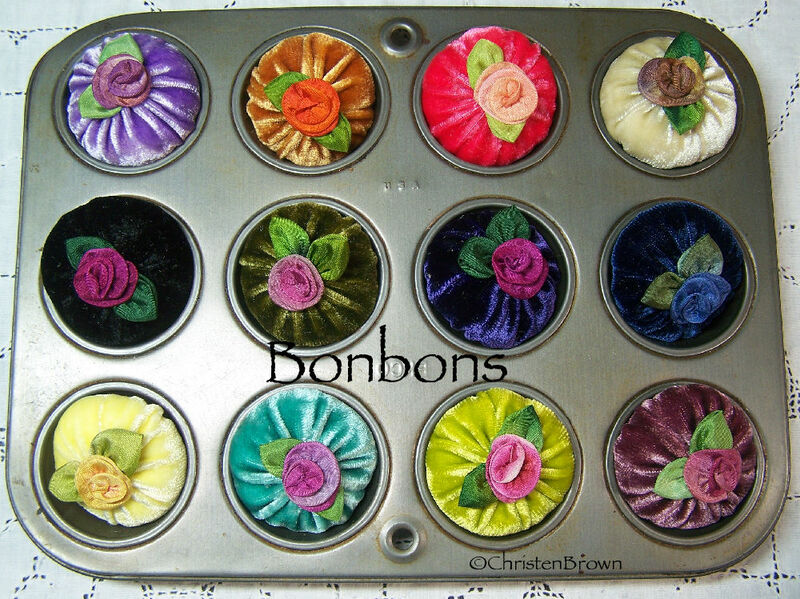 I just baked (rather stitched) a fresh batch of my velvet bonbons. They are available for sale in my Etsy Store here. The perfect gift for that someone special who loves pretty little things! 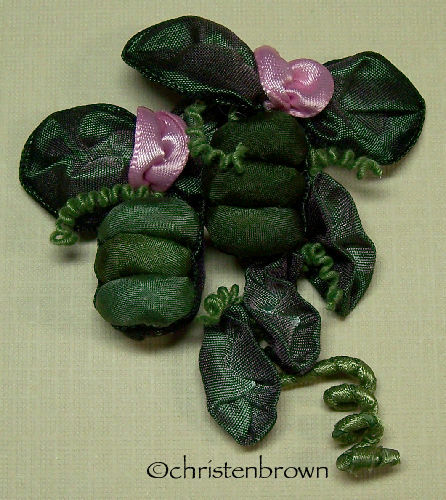 This is a tiny pincushion made from velvet rayon ribbon, embellished with a handmade silk bias rose and leaf. Each pincushion is approximately 1-1/2″ round by 1-1/4″ tall, with a felt covered bottom. Just right for a one or two needle project.